The QIA, via its subsidiary Qatar Holding, currently retains a 23.05% interest in the Lau-family controlled Lifestyle International. Thomas Lau and his family hold a 51.69% stake (see Part 2 of this series). As we detailed in a previous post (“Thomas Lau, Insider Trading”), Thomas Lau was found guilty of “Insider Trading” by a Hong Kong government tribunal in 2006. Lau appealed the Tribunal’s findings through several layers of the Hong Kong court system, but in December 2009, Hong Kong’s Court of Final Appeal ruled in favor of the government, ending Lau’s case. Just three years after the final resolution of Thomas Lau’s “Insider Dealing” case, Joseph Lau’s name surfaced in April 2012 at a corruption trial involving Ao Man Long, the one-time Secretary of Land and Public Works of Macau – China’s other Special Administrative Region, a former Portuguese colony and home to the world’s largest gambling scene. 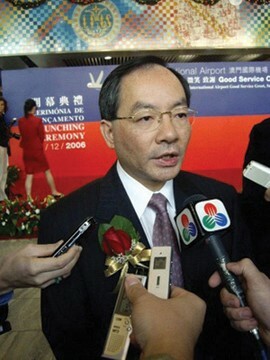 The Macau court, according to Forbes reporting, heard that a company controlled in part by Joseph Lau “allegedly paid a bribe of 20 million Hong Kong dollars ($2.6 million) to Ao in his role as Secretary for Transport and Public Works in 2005 that allowed the pair to acquire land on the Cotai Strip, opposite Macau's airport.” The land site in question was developed by Joseph Lau’s firm Chinese Estates (of which Thomas Lau formerly served as CEO before his Insider Trading conviction forced his resignation). “The Macau Court of Final Appeal was told that Ao had met tycoons Steven Lo Kit-sing or Joseph Lau Luen-hung - Thomas's older brother - or both, at least 11 times between 2005 and 2006 over the sale of five plots of land opposite the Macau airport. Three Macau Independent Commission Against Corruption investigators made a Powerpoint presentation of an extensive range of documents confiscated from Ao's former home in late 2006 and other exhibits. They were displayed in a five-hour session of Ao's trial on charges of bribery and money laundering. Later in May 2012, the Macau government filed criminal charges against Joseph Lau (not Thomas) for bribery and money laundering. The South China Morning Post later reported that Joseph Lau, who faced trial in Macau, “strenuously denies the allegation levelled against him,” and prepared to mount a legal defense. The paper noted that under Macau law, “the penalty for offering a bribe to a public servant is three years in jail, and between five and 12 years for money laundering.” The South China Morning Post would later, in June 2012, publish an extensive investigatory piece on the Joseph Lau Macau case (titled “Macau’s big scam”), reporting on details from Ao Man Long’s personal notebooks confiscated by government authorities. The Joseph Lau bribery and money laundering case in Macau was delayed multiple times due to Lau claiming illness. Lau sought in June 2013 to be tried in absentia, staying in Hong Kong for the criminal proceedings in Macau. The criminal conviction against Joseph Lau stands in Macau, yet he has, to date, spent zero days in a Macau jail cell. Occasionally, stories will surface in the press about an extradition treaty between the two Special Administrative Regions that could imperil Lau. For instance, in January 2015, the South China Morning Post wrote that an “upcoming extradition treaty between Hong Kong and Macau may apply to cases predating the agreement even if no specific retroactive clause is written into it.” Such a treaty, the paper reported, “could let Macau finally mete out justice to two Hong Kong tycoons its courts convicted in March - Joseph Lau Luen-hung and Steven Lo Kit-sing” (Steven Lo was also convicted in Macau of criminal charges related to the land case). But still, Joseph Lau stayed in Hong Kong, a free man living a billionaire’s lifestyle. In February 2016, the South China Morning Post again reported that “Fugitive tycoon Joseph Lau Luen-hung could serve time in a Macau jail under a yet to be agreed landmark deal between the city and Hong Kong.” If the treaty contained a “retroactive component,” and the verdict still effective, Macau’s Secretary for Administration and Justice stated, the territory could seek extradition. A year-and-a-half later, Joseph Lau continues to avoid prison in Macau, although he has hardly avoided the spotlight in Hong Kong with news of his personal life splashing across news pages with regularity. We will revisit the Lau family behind Lifestyle International, taking a closer look at some of their other business attempts in Macau.